Normally, my husband would consider dinner incomplete without some form of protein on his plate. However, when corn on the cob is in season, this is not the case. His very favorite summertime meal is simply corn with a side of tomato and cucumber salad. No meat means more room for corn! I always cook a few extra ears for an absolutely sublime–and simple–salad the next night. (Click here for the recipe.) I must put these ears out of sight or there will be no leftover corn for the salad! 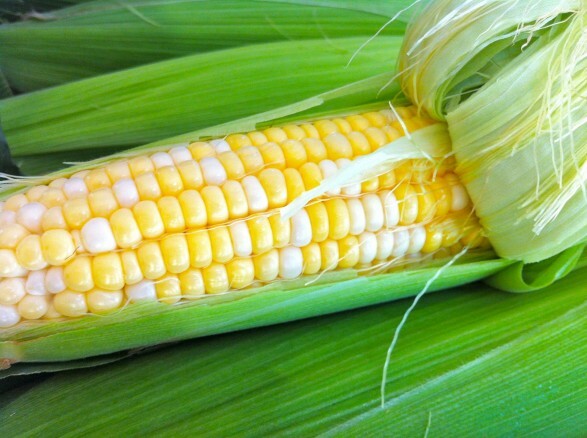 Living in Lancaster County, we are fortunate to have an abundance of local corn throughout the summer months and are spoiled to be able to eat corn the same day it is picked. Eating those first ears every summer is truly a thrill. Growing up, I remember the pearly white kernels of Silver Queen were the gold standard. For my family, corn had to come from Funk’s. These days, there are many varieties that are as delicious as our old favorite. When I buy corn, I often select a combination of white, yellow, and bicolored ears and we have a taste test at the dinner table. Typically, the bicolor wins for its sweetness and plump kernels. Often, the yellow is quite sweet with a smaller, more delicate kernel, while the classic white is consistently nice and meaty. As you can see, we like our corn…and we like to analyze it! As a versatile and truly quintessential summer vegetable, people have their own tried-and-true ways of cooking corn, serving corn, and using leftover corn. I thought it would be fun to share my preferred methods and include tips and suggestions that I have received from my Fountain Avenue Kitchen friends. If you have something new to share, please comment below and I will add it to the list. Who knows when we might hit on a tasty new idea or recipe! It has been years since I have waited for a big pot of water to boil in order to cook corn on the cob. Instead, I put about an inch or two of water in my big stockpot and stand the husked ears upright (fat end down), cover, and bring to a boil. Simmer 10-15 minutes for large ears. My mom always said you can smell corn when it’s done, and I totally agree. One Kitchen friend commented that her family soaks unhusked ears for 20 minutes and then grills for 15-20 minutes over medium heat, turning occasionally. When done, the husks and silk come off easily. The previous method is similar to how my dad cooks corn. Years ago, he and his father built a stone oven in my parents’ backyard. Its primary use–big corn roasts. Dad soaks the unhusked ears as above, and then places them on the hot grill and covers them with wet burlap. He continues to wet the burlap so it doesn’t burn, and the corn half steams, half grills to unparalleled flavor perfection. Some like to microwave their favorite summer veggie. Four minutes per ear is the perfect cook time for one reader. Then she “whacks the base off and peels the husk backwards–no silk to deal with” this way. 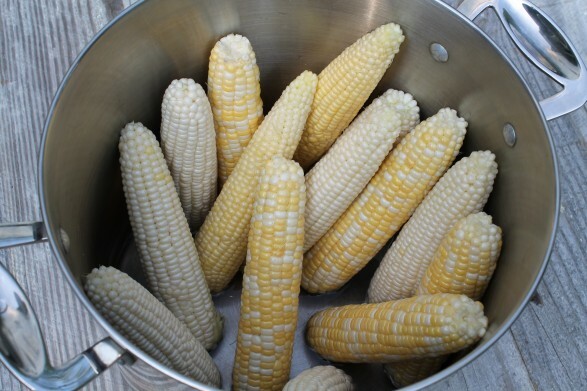 Another friend describes the method her mom taught her: Bring a pot of water to a full boil and add your corn, then bring back to a full boil and turn off the heat. 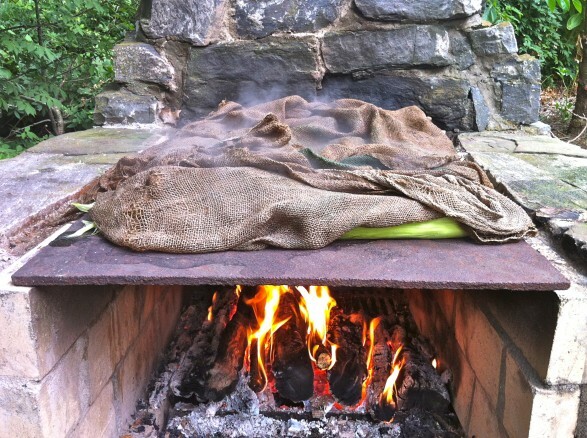 Let sit, covered, for 15 minutes (can sit up to 30 minutes), and the corn will be perfect every time. An out-of-town friend showed me a clever, no-mess trick years ago, and it has delighted kids and adults ever since. No more butter slipping off the knife and–even better–no waiting for the butter dish to be passed! Simply cut a piece of sandwich bread into 9 pieces. (See photo) Place a pat of butter on top of each bread square and arrange on a dish. Swipe the bread over the corn to butter and–Voila!–buttery perfection. In a similar fashion, another friend recently mentioned that when her family is having hamburgers with their corn, her husband likes to place a pat of butter on the roll and proceed as above. The added bonus is a buttered roll that he says makes his burger taste even better. Many are partial to rolling the cob on the whole stick of butter. Some have special gadgets that hold the butter and keep fingers clean. Others use a fork to get the job done as the tines grip the butter better than a knife. Several reported using the butter-on-the-bread idea but with one slice (usually the heel) loaded with butter. The slice is passed around the table and, in some cases, the last person to butter the corn or the most well behaved child gets to eat the butter soaked slice of bread! 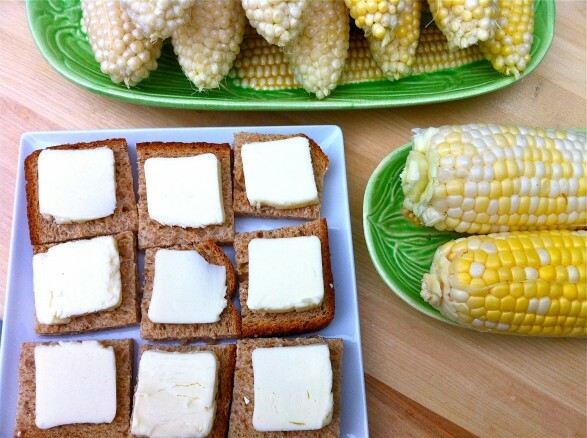 Or melt butter in a 9×13 baking pan and roll the ears of corn in it, salt them, and line them up in the same pan to serve. Everyone gets corn that is already buttered and salted! And this just in…Use a quart jar with hot water and butter in it, filling only three-quarters of the way. When the butter has melted, it will be on top of the water. Put the ear of corn in and, when you pull it out, it will be coated with melted butter. Until I married my husband, I had never heard of Jane’s Krazy Mixed-Up-Salt, but all of my in-laws prefer this seasoning to regular salt. They call it Krazy Jane’s. My husband actually bought a container to keep at my parents’ house for when we eat corn there! Several people have commented that they like barbecue sauce slathered on their corn. Or how about Old Bay seasoning? One reader drizzles her corn with olive oil, tops with chopped cilantro, minced garlic, and shredded coconut then wraps it in foil and bakes or grills. I never thought of coconut on corn! Another grills then sprinkles with lime juice, cotija cheese, and a dusting of cumin. Or how about roasting then rubbing on some lemon juice and topping with salt and chili powder? Or perhaps shaved Gruyere and freshly ground black pepper? 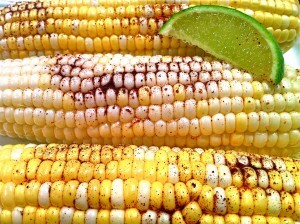 Rub the corn with a lime wedge then sprinkle with chili powder…Corona with lime was recommended as the perfect beverage accompaniment! I received two suggestions for a thin spread of sour cream sprinkled with chili powder or cayenne and a bit of salt. One suggested rubbing with lime first. Mayonnaise had never occurred to me but some people prefer it to butter. Keep the ideas, tips, suggestions, and even your favorite corn recipes coming. I will update as I receive your comments and link in my recipes as I cook them. Feel free to comment here or email me at ann@fountainavenuekitchen.com. I actually Shuck the Corn and then place it directly on a grill on high. Turn them every once in a while and you will see the color deepens on each side as it is done. Done this way you can cook it lightly and have it absolutely plain or get the corn darker for the Roasted flavor and use it for a salad with Tomatoes, roasted peppers, onions, black beans & a vineagrette. I have never done it that way but think I have to try! I bet the roasted flavor is really pronounced and the salad sounds wonderful. Thanks for the great suggestion! I tried this when my oldest son had braces, and now it’s the only way we eat fresh corn. A friend’s husband would request this for dessert. Slice the kernels off the cob into a large sauté pan with melted butter. Cook, stirring occasionally, until heated through. Sprinkle with a tiny bit of sugar if the corn wasn’t just picked. Add some salt and pepper, if desired. You can season it any way you like corn on the cob. Ann, when your folks cook on the stone grill, do they always have the slate on top? I am intrigued by that! how is it for cooking meat and fish? This is a project my husband would absolutely love. Must show this to him. Love the corn recipes too. Ann, I love the stone stove! Perfect for summertime, Going to have to see if I can convince hubby to build me one! Than I can have corn just the way you do! Love all the ideas in one spot! Thank you, Joan! We are big fans of corn on the cob and really enjoy this! Love the reference to Krazy Jane’s salt. My husband, a native Lancastrian, introduced it to me and now it’s my “go-to” salt. I just put it on my grocery store list, Judy. It always comes out during corn season here! There is nothing better than fresh corn in the summer! We eat it a couple of times a week. What a cute idea with the butter pads! A corn farmer told my husband to remove the husks and silk and place the corn directly on the oven rack in a preheated 400 degree oven. Cook for 20 – 25 minutes. Remove from the oven and serve! No foil waste and no shucking hot corn! Delicious! I love the pat of butter on a piece of bread idea! Thanks for the suggestion, Mary Kay. I bet corn tastes wonderful cooked this way, and I look forward to trying! Ann I made some corn tonight, and I put in boiling water, let water come back to boil and then turned it off and let sit. After 15 minutes, I put on the grill and got some char marks on it. I melted butter and put in some lime juice and chili powder and brushed on the corn. OH MY! It was so good! That sounds amazing, Mary Lou. You’re making me hungry!